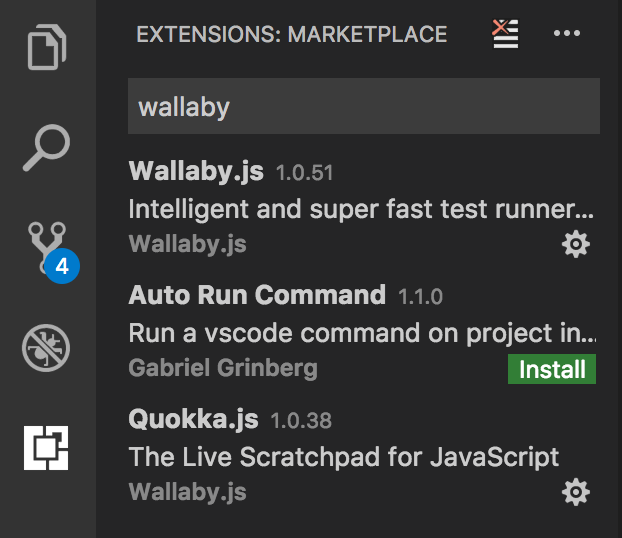 Once you have wallaby.js installed and running in any of the supported editors, you may also use Wallaby.js App to get the realtime bird’s eye view of your project’s tests connected to your editor. After the extension is installed, wallaby.js Core will be automatically downloaded and installed. Please note, that the very first time wallaby.js needs to download and install its dependencies, so it may take a minute or two. Further updates are much faster. The notification is displayed when the installation is finished. Once you have created and saved the configuration, you can start it. The first time you run it, wallaby.js may take a minute or two to install all the dependencies it needs, such as node.js and PhantomJs. It only does this once and then uses the saved dependencies. The dependencies are updated automatically when required. Once you have started the run configuration, in the bottom right-hand corner of the screen you’ll see the wallaby status indicator. 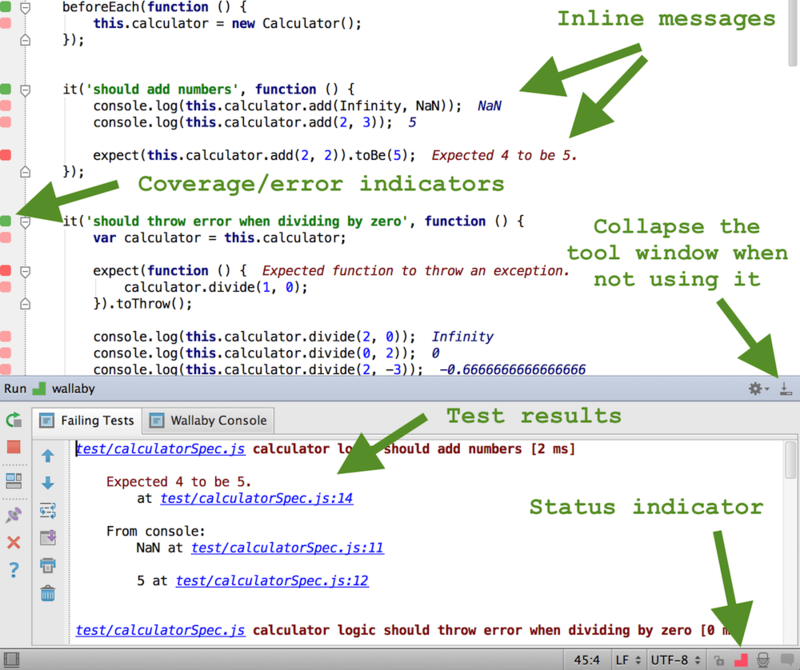 Its job is pretty simple: when it displays a spinner, your tests are running; when it’s red, you have some failing tests; when it’s green, all of your tests are passing. In the tool window you can see the Failing Tests tab and the Wallaby Console tab. The Failing Tests tab displays all tests that are currently failing along with the error stacks and registered console.log calls. Some bits of the displayed information are hyperlinks that you can use with your mouse or keyboard to navigate to different places, for example to the exact error line, or a failing test, or a place where something is logged to console. Also, when a test error contains expected and actual properties, the Failing Tests tab displays compact diff view and can display side-by-side diff view. This allows to quickly debug failing equality assertions and snapshots. Once wallaby.js is running, you can see the code coverage in the source files that it tracks (specified in the configuration file). The coverage is live, so you can start changing your code and the coverage will automatically be updated, just as you type. As you can see, there are various colored squares displayed for each line of your source code.